Desk Report: The commercial cattle farmers in the district are worried due to price fall of the animals in the local markets, especially in view of the high cost of fodder and huge labour spent for them, reports Daily Star. Aynal Miah, 46, a cattle farmer at Khorarpul village in Lalmonirhat Sadar upazila, said he purchased six calves at Tk 99,000 ten months ago and reared those with the hope of selling for good prices ahead of the Eid-ul-Azha. “But I am frustrated due to low price. Now a cow would not sell for more than Tk 35,000, which is even less than the cost for rearing as fodder price has increased,” he said. 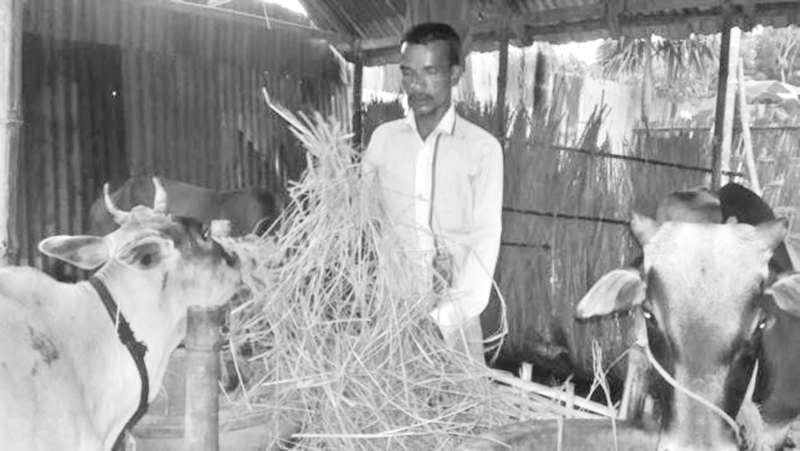 Delowar Hossain, 52, another cattle farmer at Shalmara village of Aditmari upazila, said he sold two of his seven cows for low prices in the local market in the last week. “I hope to sell the rest five cows just before the Eid-ul-Azha. But I can hardly expect any profit as cow prices have fallen by Tk 8-10 thousand each compared to last year’s,” he said. huge supply of locally reared cattle in the markets but buyers’ presence is thin, said Mamtaz Ali, 50, a cattle trader in district’s largest cattle market Durakuti Haat in Lalmonirhat Sadar upazila.